Deionized Water, Sweet Almond Oil, Glycerin (vegetable derived), Stearic Acid (plant derived), Caprylic/Capric Triglycerides (coconut derived), Cetearyl Alcohol (vegetable derived), Cetyl Alcohol (vegetable derived), Chaste Tree Berry (vitex), Cetearyl Glucoside (plant derived), Red Clover, Dong Quai, Hydroxyethylcellulose (plant fibers), Titanium Dioxide, Squalane (olive oil derived), Allantoin (sugar beet derived), Xanthan Gum (seeweed), Black Cohosh, Evening Primrose Oil, Arnica Extract, Tetrasodium EDTA, Apricot Kernel Oil, Phenoxyethanol (natural preservative). Phytoestrogens are plant-derived compounds that can produce mild estrogen-like effects in the body. Many women use our Phytoestrogen Body Cream to help if their estrogen level is low, as it is in menopause. Others find it to be helpful if their estrogen levels are high, as is the case for "estrogen-dominant" women. Phytoestrogen Body Cream is a good companion to Pro-Gest® and in finding your own natural balance. Massage about ¼ to ½ teaspoon into your skin on areas like your wrists, arms, thighs or tummy. There is no need to take a break as with Pro-Gest. 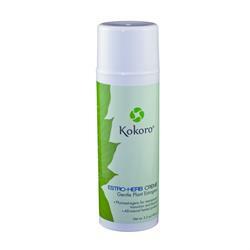 Phytoestrogen Body Cream may be used alone or as a companion to Pro-Gest®. While Phytoestrogens are not chemically identical to the hormones our body makes, they fill empty estrogen receptor sites and produce mild estrogen-like effects. Used during perimenopause, phytoestrogens can occupy some estrogen receptor sites instead of stronger estrogen, therefore resulting in a lower overall estrogen level. They have been clinically shown to help women manage their perimenopausal and menopausal estrogen balance. Dermagest is a transdermal phytoestrogen creme with Liposomes.